Who is the player from your earliest cricket-watching days that you’re most glad of having seen? One that you caught, perhaps, right at the end of his career. When talk turns to those greats of the past that we’ve seen in the flesh, I’m happy to be able to say “I saw Barry Richards.” It was in 1978, his last season in county cricket for Hampshire, and he played against Surrey at the Oval in the first county match I ever went to. The records tell me that BA Richards scored 38 that day. I have to say that all these years later I have no recollection of his innings; at the time I didn’t really appreciate who it was I was watching, or realise that it would be the only time I would see him play. I was more concerned with the result, as Surrey overhauled a challenging target of 238. At the end of the season he quit county cricket for good, and by the end of the year had written, or at least put his name to, this autobiography. Perhaps his genius with the bat, and the increased public expectation, contributed to Richards’ boredom and disillusionment with the county game. It certainly comes across in this slim book, in which he runs through his career, with a few good stories, but generally the feeling of sadness and frustration that he was unable to play in more than four Tests is the dominant theme of the book. 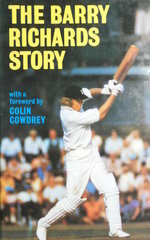 At the time of writing he had just signed for Packer and was looking forward to the challenge that the ‘Super Tests’ would bring, but as we know that was a short-lived enterprise and apart from a few matches against ‘rebel’ touring teams that was pretty much the end of Richards’ career. I’m sure there is a very good book waiting to be written about Barry Richards – Telford Vice, Neil Manthorp or Colin Bryden would, I’m sure, do a good job – in the meantime it appears that this remains all that’s available on an undisputed great. A History of Canadian Cricket: An immigrant’s game? Due to a small backlog we will be putting up two reviews this week so please come back in a few days, when we will look at another recently published book.